I had the chance to speak to some of the developers of The Bard’s Tale IV: Barrows Deep at Gamescom this year. They talked passionately about making a game that felt like it had evolved with industry over the many years the series has been silent. After trying the title myself I’m not sure they accomplished that goal, but I also don’t think that is a bad thing. 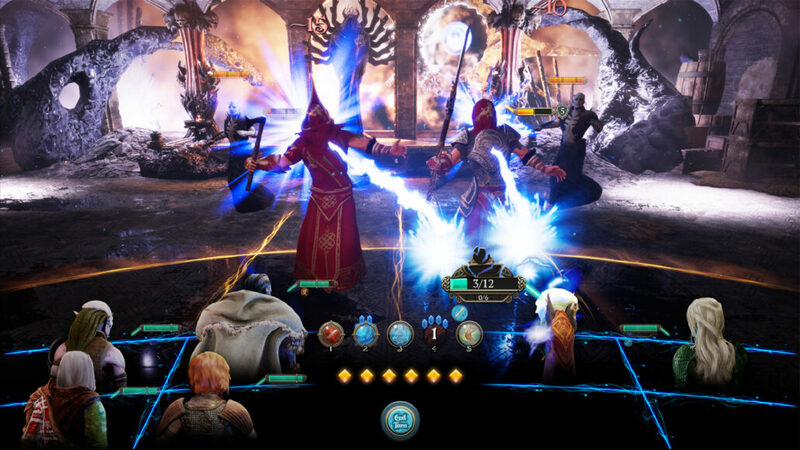 The Bard’s Tale IV: Barrows Deep straddles the line between nostalgic warmth and gameplay ease. It doesn’t feel as new and fresh as perhaps the developers wanted, but its oldness is comforting. Playing it feels like the smell of an old book, like an impossibly well-preserved relic from another time, that somehow exists and comingles with its counterparts today. For readers far too young to have played the original games, The Bard’s Tale was a series from the 80s that was lost to time. This entry in the series has jumped the story forward a couple hundred years to make up for that and hopefully not alienate anyone. The world of The Bard’s Tale IV is one of division and mistrust. In the opening cutscene you learn about the bloody history of the game, and when you start the game proper, the first thing you see is a packed gallows. It strikes a fairly dark tone for the game that is just as quickly abandoned. The threads of political commentary are instantly felt in the racial tensions between a fringe group that has managed to seize power and the underclass they hope to manipulate and oppress. But these notions are quickly forgotten, with the edginess giving way to a lighthearted, comforting tone. After all, you play the grand hero afterward, destined to restore the peaceful order of things. The world itself, besides the discomforting gallows, is filled with funny, happy-go-lucky characters, amusingly creative monsters and enough sites and secrets to dilute what might have been a much darker game. 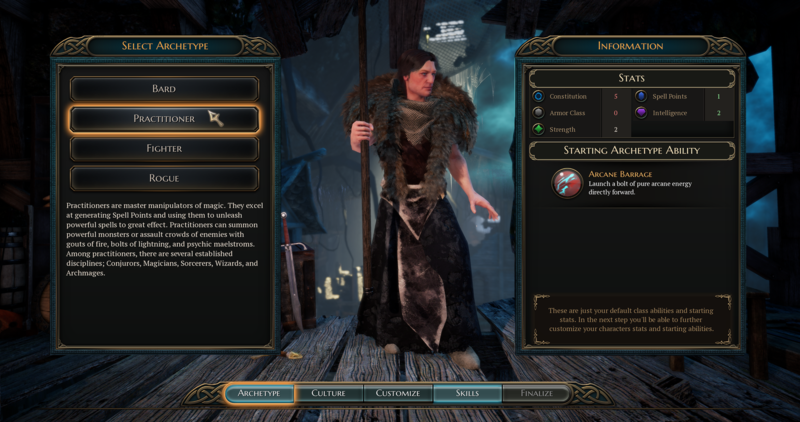 Exploring The Bard’s Tale IV feels almost like doing so in a Metroidvania game. You can interact with the specific parts of the map in a number of unlockable ways, giving you the opportunity to explore old areas and discover new things. A lot of the way you can interact with the world is through playing music as well, which is just quite delightful. On top of all that, it’s also just plain lovely to look at. While there were a few issues of texture popping upon first entering an area, the environments are imaginative and the design great. Even the town of Skara Brae looks impressive with its winding alleys filled with detail and vista that reveal huge monuments in the distance. While it might not live up to the likes of Spiderman or Tomb Raider, the visuals has a unique and pretty charm and works well with the overall mood. Naturally, given the name, I chose to play as a Bard. There are four possible classes (fighter, spellcaster, rogue and bard) each with their own skill tree and abilities. The bard is perhaps the most unusual of the cast, with players needing to get drunk to perform any of their more interesting moves in combat. The combat itself feels strangely similar to Into The Breach. Players have to carefully consider their positioning, manage telegraphed moves from the enemies and balance cooldowns. It’s all played on a small grid, but the most remarkable thing about it is the action points system. Your team has a pool of action points that you spend on any character ability, meaning you can do anything from having one character take up the entire turn or splitting it between the team. It’s not something I can say I’ve seen before but works well when you have to choose between doing damage and defending yourself. It also makes combat more forgiving than it first appears. If battles start to go badly and teammates fall, you can still do as much with a singular character, allowing you to perform strange guerrilla movements of running in and out of the fray, or keeping your distance. Its all done on a small grid, but moves tend to have small radiuses that can be easily avoided. There is a strange stealth mechanic that exits outside of combat though that feels misplaced. With absolutely nothing else to it, players can try and sneak up to enemies without being spotted to get the first strike in. You can’t sneak or peek around corners or anything else one might associate with stealth games and the system’s existence feels a little half-baked. What is nice about exploring the world though is that enemies don’t scale with the player’s level. This means certain areas and quests will be off limits until you can get some more experience. I know it’s not everybody’s cup of tea but I enjoy seeing my progression in the enemies I thought I’d never be able to kill. Progression doesn’t feel like a grind either so you won’t be waiting too long before the sewer cultists are under your heel. The dialogues, however, are a bit of a slog. Some of the jokes just take a little too long to get out, and paragraphs can drag on when they could have been a sentence or two. The voice acting is actually pretty good with some voices that definitely sounded like they were Scottish, which is not that common for video games, but the script does let it down. Overall, The Bard’s Tale IV is a rare new game that feels just a little old. People who only care for the newest thing with the newest mechanics might not appreciate the cosy, slightly dusty tenderness of Bards Tale, but it does have this delightful feeling regardless. Even if you’ve never heard of the series, or played RPGs from the nineties, The Bard’s Tale IV: Barrows Deep is a special game not to be quickly dismissed. Review code provided by the publisher. You can purchase the game at a discount on Green Man Gaming.